Primarily built for mountain bikes with limited heel clearance, the XM-28’s bikepacking pannier offer the best of both worlds in terms of access. They are essentially top-loading panniers but have side-slicing two-way zippers that will allow you to get hold of smaller items lower down inside the bag. A skid plate on the lower portion of the bag protects it if you happen to ride too close to a curb. The X-shaped compression webbing will stabilize the content on those hectic downhill runs. The XM-28’s are at home both on paved roads as well as on the wickedest trails. It also comes with a fully waterproof zippered liner inside the main compartment for total peace of mind when riding the hurricane seasons. It’s up to you to test your limits! More Details: The pictures below describes all the features of the XM-28. The images were taken with a previous version of the XM-28, the features are still current but the cosmetic look of the bag has since change. For current model refer to main product pictures above. 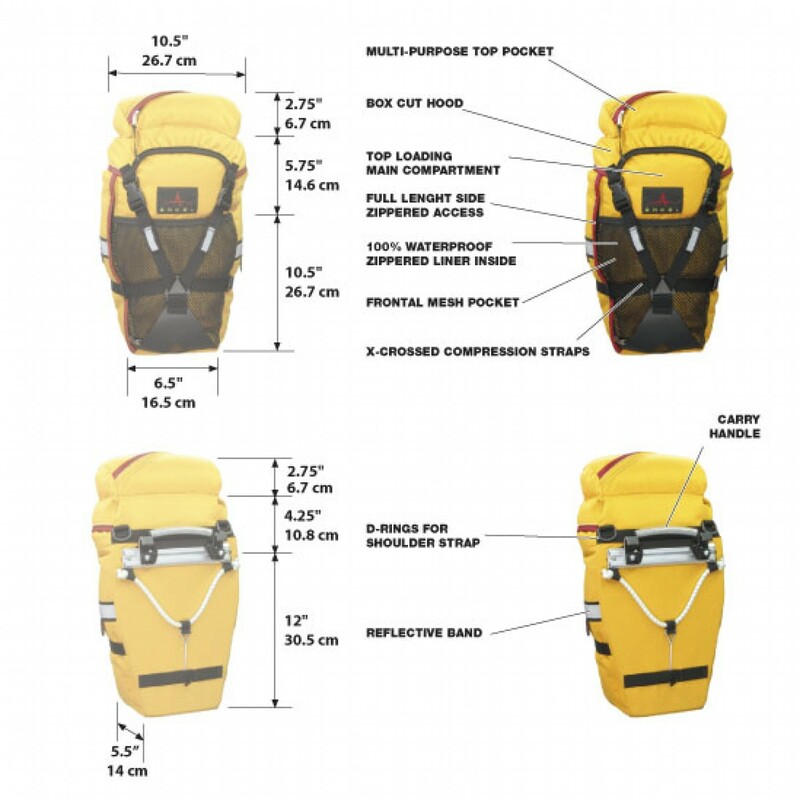 The main compartment is equipped with an internal zippered liner that keeps its content totally dry, and separate from any wet or dirty stuff you may need to carry in the main compartment. No matter how much you load the pannier, the hood and it’s waterproof lining will always fully cover the body of the bag (thanks to a cut that works like a box top). Reaching and searching in top loading panniers has always been a chore. Many years ago we innovated with our TFL® side-zipper (Total Front Loading) that "slices" the whole bag from top to bottom, giving an amazing access to the content - in a way that other bag can’t match. Thanks to Arkel's TFL® zipper, it's now possible to gain access to the inside of the bag without having to unclip all the webbing and buckles. It may sound trivial, but believe us it's a god-send when it's pouring rain and the very idea of opening the top of the bag is risky. It avoids opening a funnel to the inside of the pannier, and gives instant access to the content. The TFL® zipper has a two-way slider system - in other words you can access the bottom of the panniers at any time, just by opening the lower zipper. We all know that small items tend to sink in Top-Loading panniers, so this seemingly simplistic feature takes a whole new meaning - and appreciation - in this case. 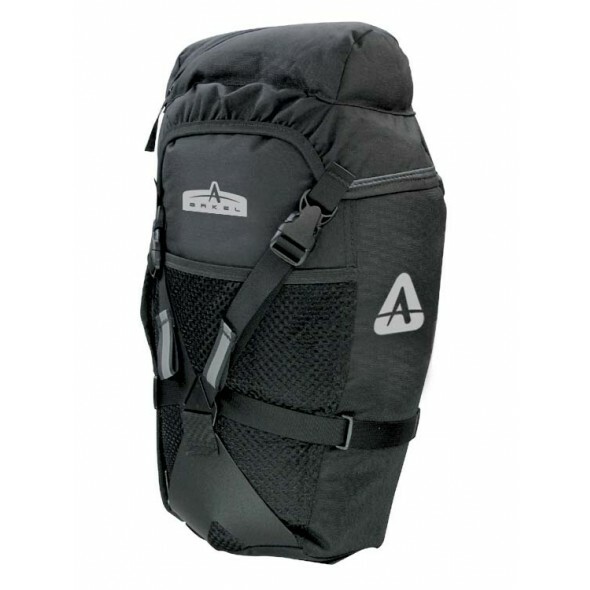 Why is it that every smaller panniers from Arkel has a mesh panel? Because they make sense: use the mesh to store a wet rain jacket or beach towel and use the compression strap to secure it in place. The object will stay put no matter the road and it'll drain and dry naturally in the mesh. Since the XM-28's are also front panniers if you need, the mesh is perfect for a road map and is accessible even as you ride. Top loading panniers are great because they can easily compress or expand depending on the load, but sometimes the compression straps may end up being a liability. At Arkel we take great care in making sure that even when unclipped, the webbing will not fall anywhere near the wheel. The X shape compression straps of the XM-28’s will help keep the load tight and close to the bike. A single cinch on the strap compresses the whole bag, pulling everything towards the center of the bag for the ultimate in load control. Using a panniers on a lowrider rack can lead to some damage on the side of a pannier should the bike gets too close to a concrete curb. It is particularly true if the bags are used on a mountain bike (smaller wheels). The XM-28's have a HDPE skid-plate that will slide on a curb, protecting the mesh panel against rips. Still, be careful please!!! Every corner where the webbing goes has a loop-lock - a "ring" in which the webbing is fed. Those loop-locks stabilize the webbing making sure that it'll never fall in the spokes of the wheel, and that it'll always align with where they should be. Oh! Note the reflective stripe as well. Safety is very important to Arkel! On top of the hood there's a pocket. The usefulness of it is self-explanatory: keys, wallet, glasses, sunscreen, etc; there's no better place to store those things. But what we did different is that the pocket is on "top" of the hood, not "inside" it. Loading the pocket will not steal space from the hood, insuring a good hood coverage at all time. The diagonal zipper is also a big plus for a great access. Every Arkel pannier has a handle for off the bike convenience. The handle is long enough for a good grip but never so long that it will flap down and rub on the bike wheel. We make sure that this is never an option, as safety has no price. You can carry your XM-28 panniers with a shoulder strap (optional). The panniers have D-rings at the back just for that. But moreover the D-rings of both panniers are located in such a way that they'll align side by side when the panniers are back-to-back. What it means is that with a single shoulder strap you can carry both panniers! How brilliant is that?! These bags rock. Have toured in multiple countries with them. I purchased both the XM-28 and XM-45 sets in early 2017 to replace the ortlieb bikepacking setup I was previously using...While I don't hate the ortlieb line, I really needed something that wouldn't eventually have holes rubbed into them (which is going to happen with most bags that rub against seat rails and frames.) This happened to my Orlieb bikepacking bags after several long trips. I was looking at the Arkel Seatpacker and Rollpacker line, but decided I'd go with some racks and panniers. I absolutely love the XM series bags. I spend most of my time on paved roads and gravel or 4WD trails, so these just made sense. I have way more room for "stuff" than I'll ever need, but I like the idea of having the ability to carry more if I ever upgrade my bike to something that could haul a ton of gear for super long trips. I have the rain covers also and mainly use them to keep my bags nice and clean. I've never had my gear get wet without the rain covers in the humid and rainy Louisiana weather, but the rain covers will make the bags last much longer in my opinion. I've come to enjoy the design as well... 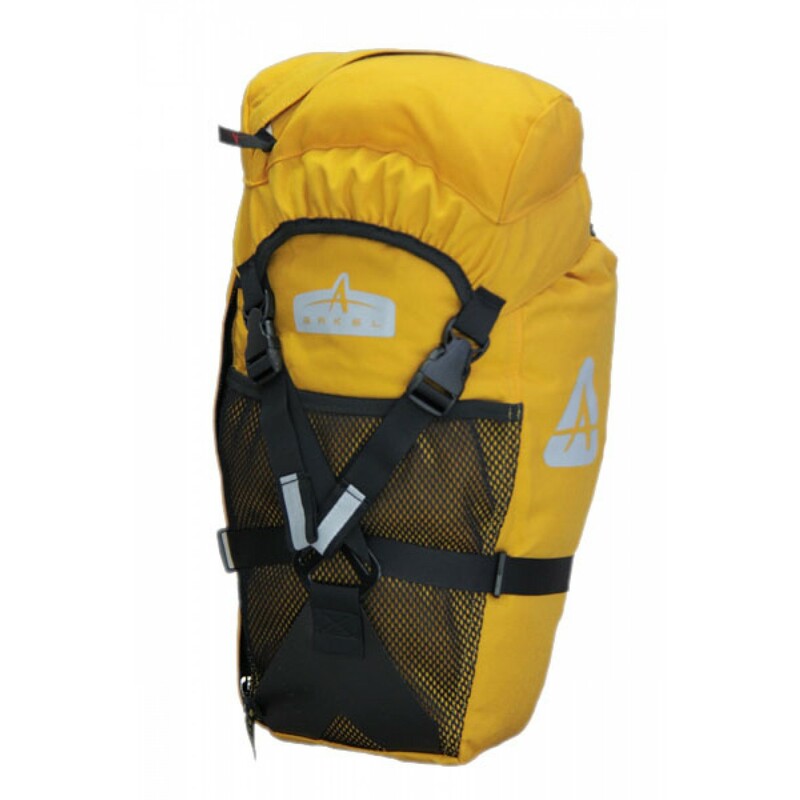 I can pack my damp gear in the bags and the dry gear in the inner liner to keep it separate, and because the bags are breathable, my damp gear gets air and it helps to dry it out without contaminating my other stuff. These bags are top notch and well designed. I like to pack extra water bottles in the top (XM-28) and rear (XM-45) pockets for those out and about trips that keep me away from clean water for days. I mount these bags to OMM Sherpa front and rear racks on a cyclocross bike that I built up as a cross country touring steed. Our xm-28 have at least 15 tours behind them, Canada to Mexico, Prague to Santiago, all off road. They have been great, stable solid, and still as good as new. However, current model is not three pounds a pair as claimed, they are four. They weigh as much as my old larger XM 45. I wrote them about updating the website but it was never done. The older model was indeed three pounds a pair, and will outlive us, so I consider the current version to indeed be "overdesigned".